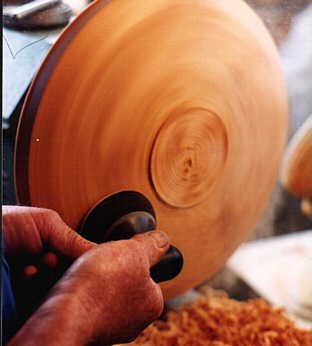 Removing tool marks from platter base. Even the best of turners will have difficulty getting a smooth base on bowls & platters without leaving tool marks of some sort. The Rotary Sander will remove those tool marks faster, easier and better than any other method, including power sanding.. Apply the coarsest grade abrasive disc (80 grit) to the sander head and use it to remove those persistent tool marks from the turned surface. Proceed to successively finer grades of paper for a brilliantly sanded finish. The Rotary Sander works very quickly and because if the spinning action of the head it will eliminate all the sanding marks you would get with conventional sanding.